Recorded on February 13, 2009. After the grand disaster of last week’s episode, I’m a bit calmer. But still barely have time to get this together. 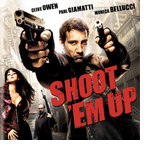 We review the Clive Owen movie Shoot ‘Em Up. Music by Legbone, Black Wolf Fight and Cavalera Conspiracy.